Photo, left: Mt. Oberlin and the Going to the Sun Road. Logan Pass is about a quarter mile to the left. Taken near the start of the Highline Trail. The Highline Trail is the premiere hike (one of many amazing hikes) of Glacier National Park, one of America’s premiere national parks. Both the hike and the park are world famous as well. The trail follows the Continental Divide, known as the Garden Wall locally, with a nonstop array of incredible views every step of the way. Also, opportunities to view wildlife (including possibly bears) and wildflowers. It is an unforgettable, even life-altering experience. Of course, it is subjective to call a trail the “most scenic in America”. We all have our own perceptions and tastes. Many people rate a trail by the payoff at the end of it. But for me, that’s a different story. If you want to be mind-boggled every step of the way, then try the Highline Trail. I don’t think there’s any trail or attraction in Yellowstone, Grand Canyon, or Yosemite that quite compares. The Highline Trail uniquely combines BIGNESS and INTIMACY. There is also a sense of “wildness” here that you don’t quite feel in other parks (perhaps because the tourism is less intensive here, or maybe just handled better). Below, left: The author, all geared up and ready to go. Note the bear spray in orange container. The Highline Trailhead is across the road, about fifty feet from this sign. Below, right: The trail parallels the Going to the Sun Road for the first couple miles. Both road and trail are considered “most scenic” for good reason. The trail is easily accessible and not that difficult to hike – some ups and downs but no steep ascents, no treacherous footing, etc. The trailhead is at Logan Pass, the heart of Glacier National Park and also a great destination. It runs 7.6 miles to the famous Granite Park Chalet (see separate story). Those lucky enough to have reservations for the chalet or nearby backcountry campground will enjoy the astounding 360 degrees of jagged mountain views and, weather permitting, an equally astounding sunset. 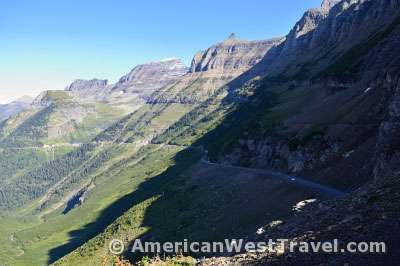 From there, the Loop Trail descends steeply in four miles to the Going to the Sun Road. 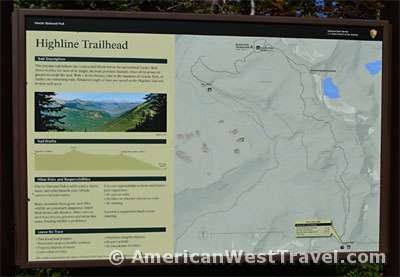 (Or you can continue north on the Highline Trail many more miles into the backcountry.) The park’s excellent free shuttle bus service lets you make it a one-way hike, leaving your vehicle at the start or the end of the trail, or any convenient place where the bus goes. 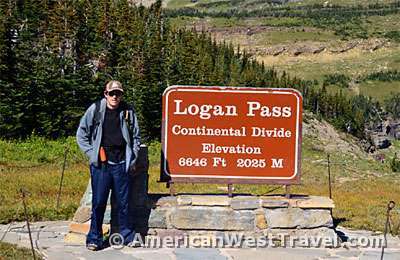 If you aren’t able to walk such distances but want a taste of the experience, simply walk the trail a mile or two from Logan Pass and then return the way you came. This is not a remote wilderness experience but the most famous hike in a great national park. Therefore you will have plenty of company on the trail but it’s a nice experience. 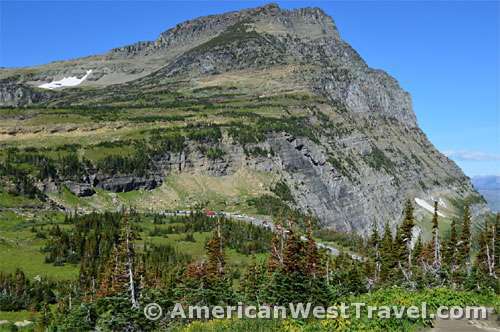 Glacier National Park is primarily a hikers’ park (RVs are not even permitted at Logan Pass or the climbing sections of Going to the Sun Road), and many or most of the folks you meet on the trail have some degree of wilderness/outdoor awareness or ethics. The excitement and happiness at the trailhead is palpable; most of the hikers seem to be aware they are embarking on a big-time adventure. The socialness continues along the trail, too: Everyone takes frequent breaks for water or photos so you are continually passing the same people, or they are passing you. So brief acquaintances are made. Couples often ask others to take their picture, as we did. People marvel together at what they’re experiencing. I asked numerous people if they thought the Highline Trail was the “most scenic trail in America”. No one had any alternates to suggest. 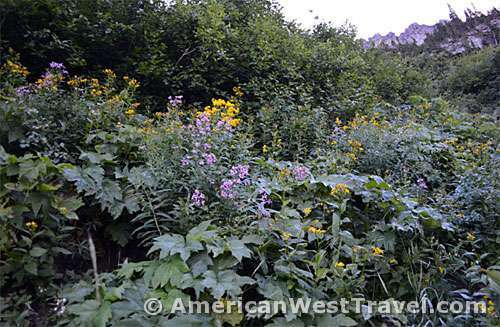 Photo left: Beautiful wildflowers are present everywhere in Glacier.